Thanks to its customers’ confidence, Talleres Felipe Verdés S.A. is continuing its success with further new projects in Algeria. At the El-Barakate (II) Brick Plant, a second shaping line was installed parallel to the existing one. The line comprises a 028PC box feeder, a 046-C mixer, a 086FDH roller mill and a 069RB monobloc extruder. 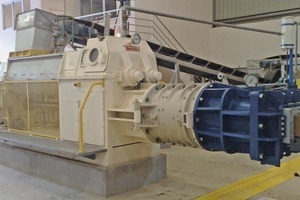 To support the preparation line, a new 118-DT roller crusher was installed. The preparation line supplied to SARL Comep is a semi-wet line comprising two 027PC box feeders (for different types of clay), a 117-DT roller crusher, a 126D disintegrator, a 085FD roller mill and a 045-C mixer, in which sand from a 027BP box feeder is added. The clay prepared in this line is stored before being fed to the downstream shaping line, which is equipped with a 028PC box feeder, a LABH-092 hinged roller mill and a 069RB monobloc extruder. 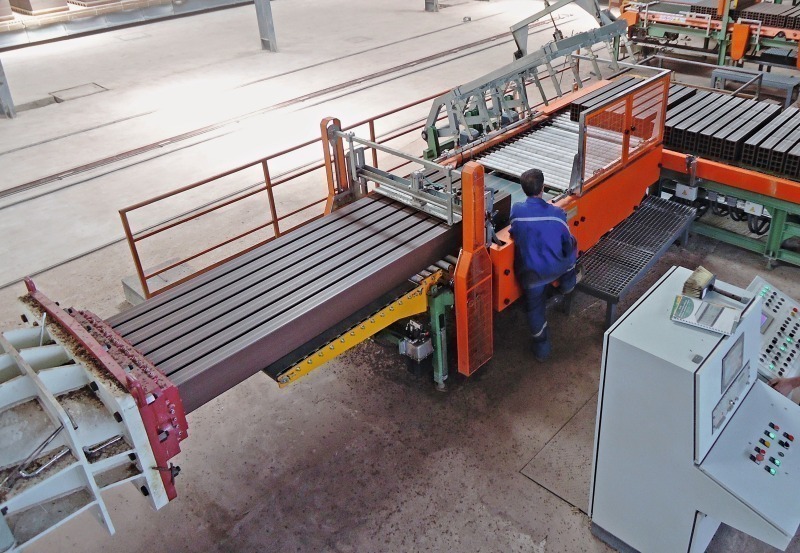 The Belhadi Brick Plant, with a daily production capacity of 600 t finished products, also has a semi-wet preparation line. This is equipped with a classical disintegrator, downstream clay storage and a shaping line completed with an extruder Combi 077C. 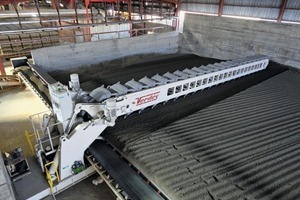 In contrast, the SARL Progec Mac Brick Plant uses the dry preparation process. This type of preparation is used increasingly in order to obtain better brick quality. This line comprises 038/VB hammer mills, a 046C mixer and an extruder combi 076RB. The first Verdés dry preparation line in Algeria was installed some time ago at SARL Briqueterie El Rym, Annaba. 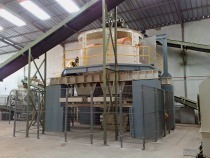 This dry preparation process comprises a 118-DT roller crusher and two 038/VB hammer mills. The ground clay is stored in silos and dosed in powder form into a 046-C mixer. 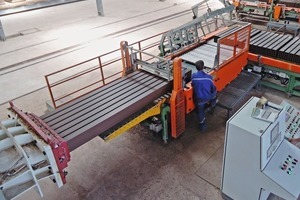 With the extruder combi 077C, an annual production rate of 280 000 t fired bricks is achieved. 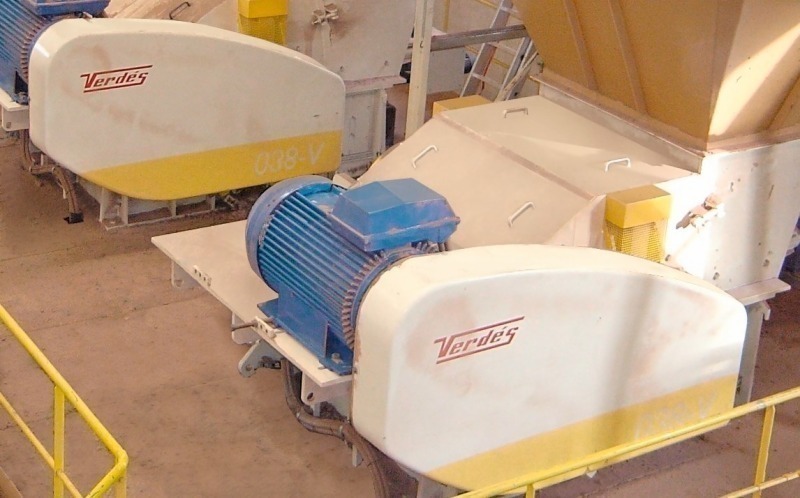 Other lines with Verdés machines are set to start up operation in the first half of 2015. 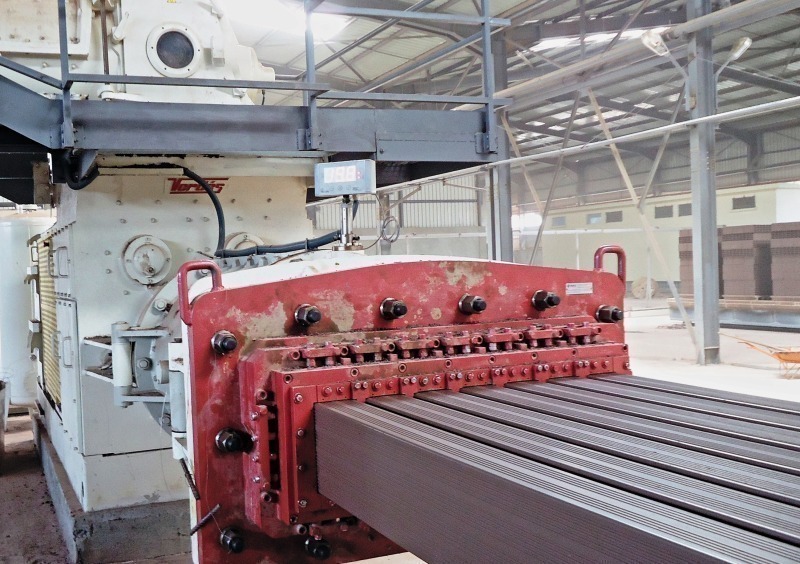 Amraoua (Tizzi Ouzou), Timadanine (Adrar), Zibane (Biskra) as well as the second phase of the Ennadjah Ouel Amel brick plant (N‘Gaous) are also at the commissioning phase. This last plant will soon combine the two processes (dry and semi-wet preparation). The dry line will, of course, be equipped with hammer mill. 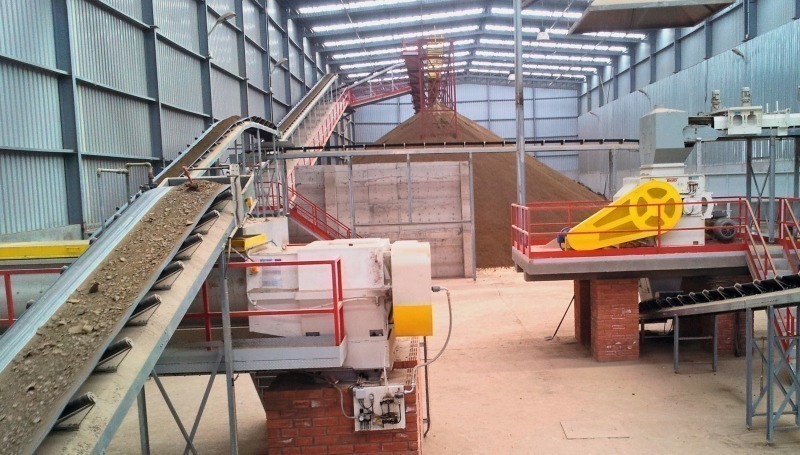 The Industrielle Amraoua Brick Plant comprises four 028PC box feeders, a 117-DT roller crusher, a 127C disintegrator, a 086FDH roller mill and a 046-C mixer (with a 027BPC box feeder for the sand that is added and mixed with the clay). 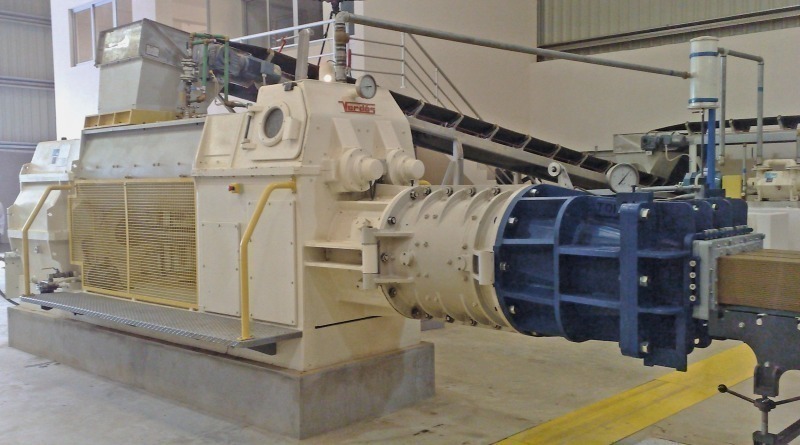 Following storage of the clay, constant and stable production in the shaping area is ensured with a LABH-092 hinged roller mill and an extruder combi 076RB. 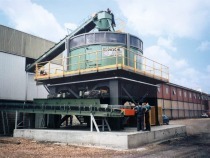 SARL Timadanine Brickworks, a high-capacity plant, consists of a preparation line with two 028PC box feeders, a 118-DT roller crusher, a 128C disintegrator, a LABH 092 hinged roller mill and a 046-S double-shaft mixer able to process up to 200 t/h wet product. 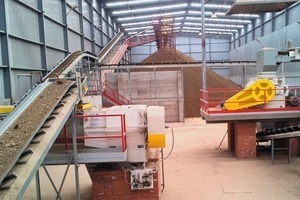 The prepared material is stored in the ageing clay storage unit and reclaimed from it by means of DRAVH bucket excavator. In the shaping line, there is another 046-C double-shaft mixer, a refining LABH 092 hinged roller mill and a Combi 077C de-airing extruder, ensuring a daily production of 900 t fired product. The new line in the SARL Briqueterie Ennadjah Ouel Amel (II) plant was installed as an extension of the already existing line and consists of a 028PC box feeder, a 086FDH roller mill, a LABH-092 refining hinged mill, a 046-C double-shaft mixer and a Combi 077C de-airing extruder. 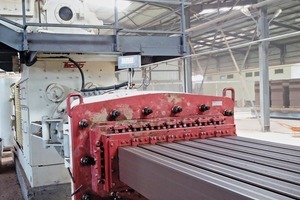 Looking for higher flexibility, the Ennadjah Ouel Amel Brickworks is contemplating the possibility of working as well with a dry grinding line, thanks to the forthcoming commissioning of a 039/VB hammer mill, which is able to supply two shaping lines with 80–90 t/h of clay ground down to sizes smaller than 1 mm. 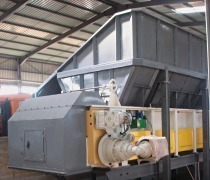 The SARL Briqueterie Zibane was designed with a high-capacity and high-throughput dry grinding preparation line consisting of two 038/VB hammer mills in parallel and a 046‑C double-shaft mixer. The prepared clay is stored and after some time conveyed to a 028PC box feeder for accurate and even dosing to another 046-C double-shaft mixer and a hinged roller mill. The clay body is extruded in a new Magna 775 de-airing extruder. The output of the plant that is currently being delivered is to total 350 000 t/year. Other projects in 2015 are: Briq Oasis (210 000 t/year) in the Boumerdes district; Messaoudi Prest (400 000 t/year) in the Ouargla district; Greco (140 000 t/year) in the Tiaret district; Boukhanoufa II (200 000 t/year) in the Batna district; and Benabdallah II (280 000 t/year) in the Bou-merdes district. The growing interest in dry grinding preparation is derived from the fact that it is an effective and reliable alternative to the wet or semi-wet process. Advantages of dry preparation compared to wet and semi-wet processes are lower maintenance and operational costs (lower medium-term energy consumption, less required manpower). 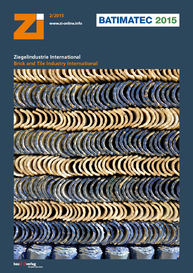 The required investment for a dry grinding preparation line, including machines and associated construction work, is also noticeably lower than that required for an equivalent classical wet grinding preparation line. Additionally, the finished sealable product resulting from a dry grinding line boasts improved product quality thanks to the finer particle size distribution obtained in preparation (< 1 mm). The final product consequently has a better surface texture, higher density and mechanical resistance. The lower shaping moisture results in a more cost-effective drying process. However, the dry grinding process is generally limited to a maximum raw material moisture content of 10 to 12%. Alternatives are available if the clay moisture is higher, such as temporary covered storage or an upstream drying process. Every case should then be analysed individually in order to obtain the optimum solution for each application. 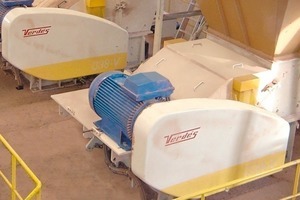 Verdés supplies a full range of machines for clay preparation, both for wet and dry grinding processes. The company is therefore able to analyse each case and define the most suitable solution. The new installations in Algeria are not the only lines delivered by Verdés to North Africa. 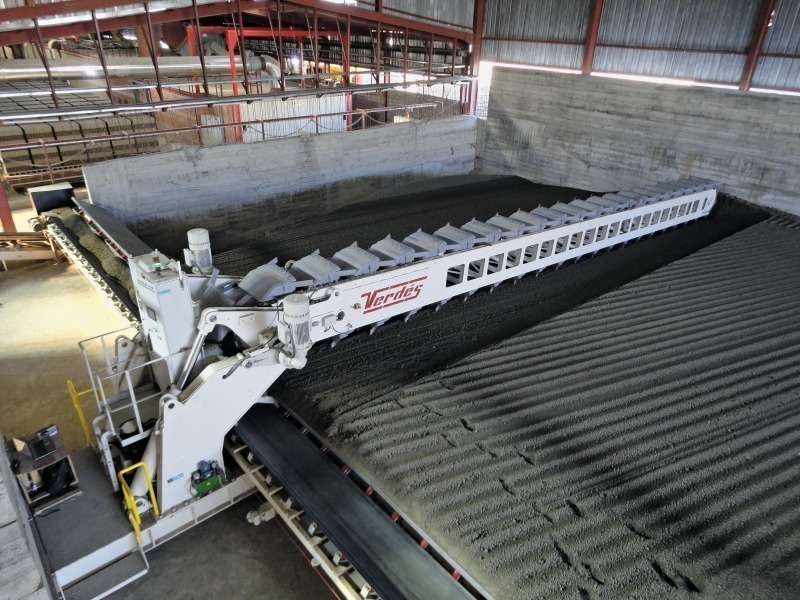 Other plants in Morocco (almost ten over the last five years) and also recently in Tunisia have proven Verdés’ ability to reduced production costs and achieve better finished product quality.